18 hole, par 72 course, 6,811 yards of play. 18 hole, par 72 course, 5,611 yards of play. 18 hole, par 72, 6,500 yards of play. Book a package with Moree’s Sportsman’s Preserve for more great times in the Cheraw Area. 27 holes of championship golf, par 72 course, 5,908 yards of play. As the only 27-hole course in the region, this championship golf course is known as a fair but challenging experience. The 3, 9-hole courses (Carolina Pines, Grande View and Cove Course) offer extreme topographical changes and strategically placed hazards to make this course a worthy adversary to golfers of all skill levels. The 18th hole of the Grande View Nine was voted “Favorite 18th Golf Hole in the Charlotte Area” by local radio listeners. 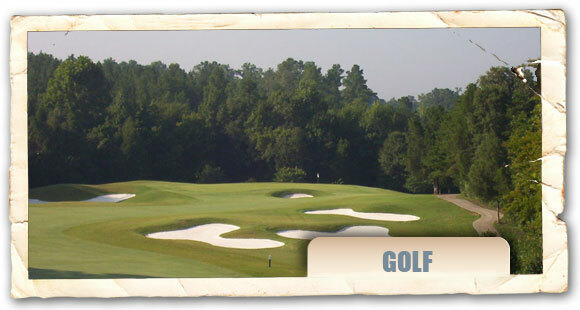 Hale Irwin designed championship golf course; 18 holes, par 72, 6,913 yards from the back tees with winding creeks and tall pines. Great layout along the Catawba River with the best putting surfaces in the area. Full practice facility. Lessons available for all ages and levels of play.